Quartz is an incredibly strong, durable, and flexible material. 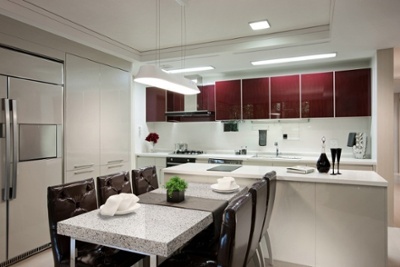 An engineered stone, quartz is composed of a ratio of 93% quartz crystals to 7% resin. Quartz kitchen countertops are non-porous and do not require sealing to prevent stains. Counters made of quartz are very easy to clean. Quartz color patterns are consistently uniform without random variations among slabs. Quartz kitchen countertops can discolor over time when exposed to direct sunlight. Although quartz is heat-resistant, high-heat appliances can damage its finish. Seams can be visible in quartz kitchen countertops, but they are less apparent in patterned slabs. Granite kitchen countertops are all natural. They are made of 100% naturally occurring granite, which contains quartz, feldspar, and mica. Granite is initially mined in large blocks from quarries; it is later cut, profiled, and polished into slabs for custom installations. Your granite countertops will be uniquely yours. Because granite is taken directly from the earth, it does not have a uniform appearance, and naturally occurring variations will add special pigment to particular slabs. Granite is a very durable and color-consistent material resistant to heat and scratches. Granite is a very solid material, but it is not as strong as quartz. Because granite is a crystalline structure, it can suffer chips and fractures if subjected to sharp objects at high impact. 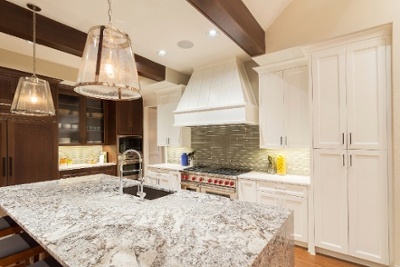 Granite is a porous stone and can be susceptible to staining and harboring bacteria. Your granite countertops should be sealed upon installation and on an annual basis to minimize the risk of stains. Seams will be apparent within a granite counter, especially with slabs having veins and directional movement in the palette. Which stone is right for your kitchen countertop? If you are having trouble deciding, feel free to check out our current specials and discuss stone options with our fabrication experts. With our extensive knowledge and supply of stone varieties, we can help you achieve the perfect balance of beauty and functionality in your new space. Get started today!